Here at GeekOut, we love to play board games. During our meetups, we love to get out the pen and paper, the dice and the figurines. We’re big fans of being traditional and enjoying games that gets people talking. In the 80s, video games were just about hitting their height in popularity. Some would even call it the golden age of gaming. 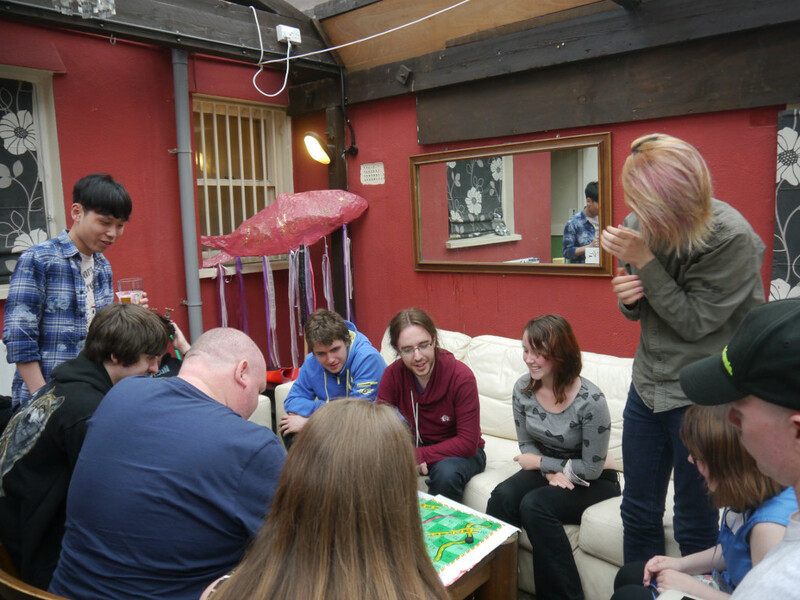 Today, I’m happy to announce next week’s GeekOut Bristol Meet is dedicated to those games. We’re going back to the 80s with our 80’s themed retro party! Join Timlah to find out more. The 80’s was an era that brought about some of video games most iconic characters; from the balls to the wall tricky games such as Contra and Mega Man, through to titles such as Pac-Man, Tetris and of course the famous plumber himself; Mario. It’s hard to believe that the 80s begun 36 years ago. So, we’re going back to the past, busting out the classic GameBoy and we’re gonna have a party (fair enough, we didn’t see the classic GameBoy in Europe until 1990, but it counts)! Older video games are going to be the celebration of the event. Check out the walls of the Old Market Tavern if you’re swinging by, for wall decorations of all of the classic characters of video games. Don yourself an 80s costume and let’s get ready to GeekOut once more! Our venue has reached out to me and have kindly agreed to pay for the prizes for this months competition, along with the added prize money we’ve added into the pot. Player One, are you ready for the events we have in store? You’d better be fully equipped with your best Master Sword and shield. So don’t be afraid to curl into a morph ball if your suit is anything like the mighty Samus Aran, do a barrel roll and let’s party like Donkey Kong! It’s time for us to pay homage to our favourite old school games and the franchises that they’ve spawned. But hey, we’re not just making this event about old school. What’s our itinerary for the day? As always, we’ll be meeting up for our pre-event food at midday. We’ve got a poll open until Tuesday 5th, where people are able to choose what venue we go to. Technically anyone can put the vote in, but we leave it mostly for those who are attending our event. At the moment, it looks as if Frankie & Benny’s is winning it, which is pretty damn yummy. We’re really lucky here in Bristol that we have Cabot Circus basically right next door to the Old Market Tavern. It means food is easy to get a hold of so early in the day. Once we’ve finished meeting and eating at Frankie and Benny’s, it’s over to Old Market Tavern where the main event begins at 2pm. When the door opens, our attendees will see retro themes adorning the walls and the tables. From retro games and the old school taking a big presence, we’re encouraging our attendees to swing by in 80s attire and 80s costumes. I’ve got myself a Mario costume on the way, so I’m sure someone will capture a picture of me in that! Who knows, if we’re lucky, perhaps we’ll see people from all eras of video games make an appearance? Perhaps I should take Mario with me to AmeCon later in the month as well? Hmm, so many questions that are left unanswered as of yet! 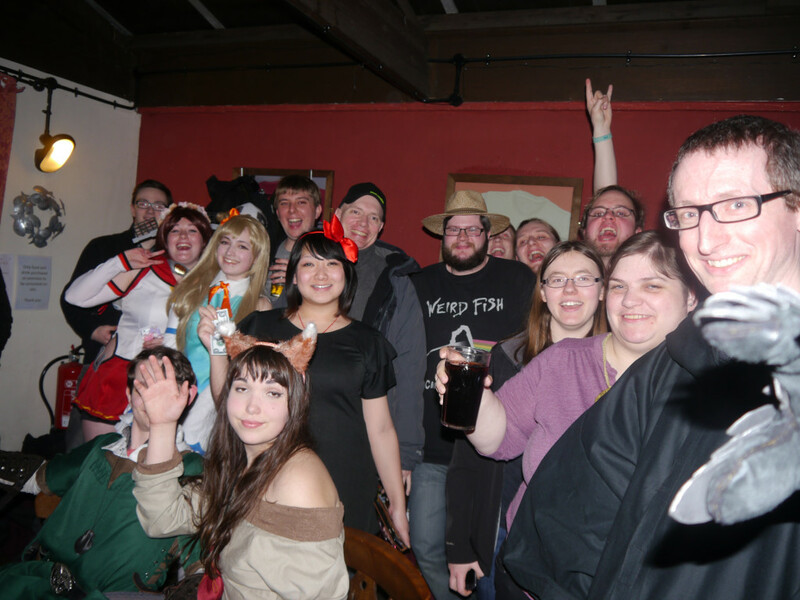 As always, these posts are about letting you know what’s going down at the next event. As well as our activities, what’s new to GeekOut this month? First of all, let’s talk about our partnership with the Old Market Tavern. The lovely owners helped us fund the prizes for this months event; going so far as to buying the main prizes as well as the cash for each position. So, what does each prize net? 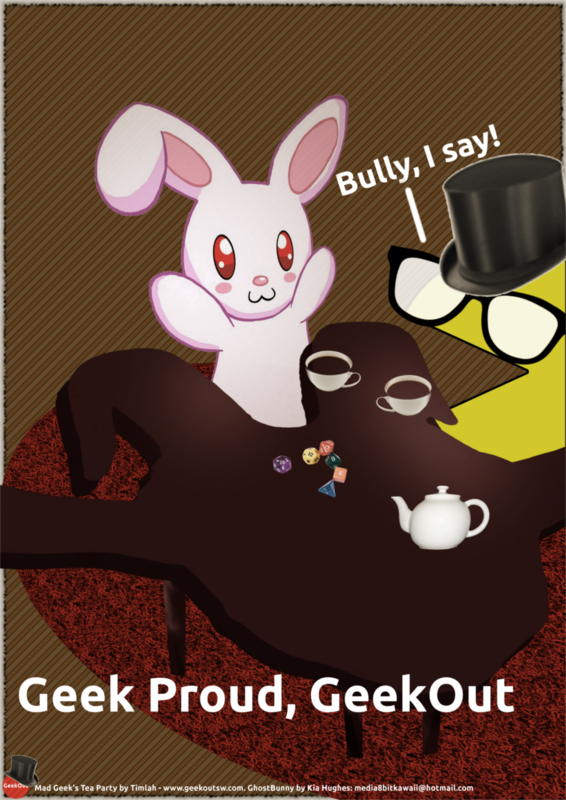 Our latest GeekOut poster celebrates the Tea Party we had last month! 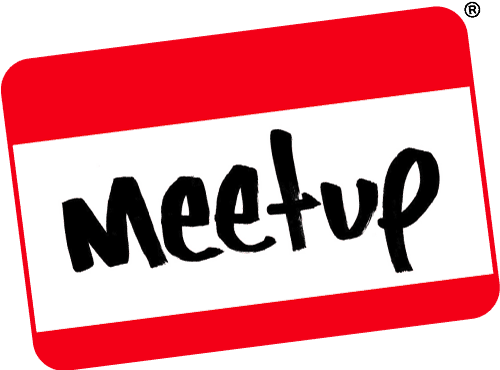 If the above tickles your fancy and you’re around Bristol next Friday, why not join us for the GeekOut Bristol Meetup? What about those amazing prizes this month, eh? It’s only a week today before our next event, so come join us if you can. We’ll be sure to have plenty of board games, video games, chats, costumes and more, so please do swing by! That’s it from me for this month’s preview of what’s to come; thanks for joining me everybody. Let me know what you think of our theme in the comments below, or over on Facebook, Twitter or Reddit. This entry was posted on July 1, 2016 by Timlah. 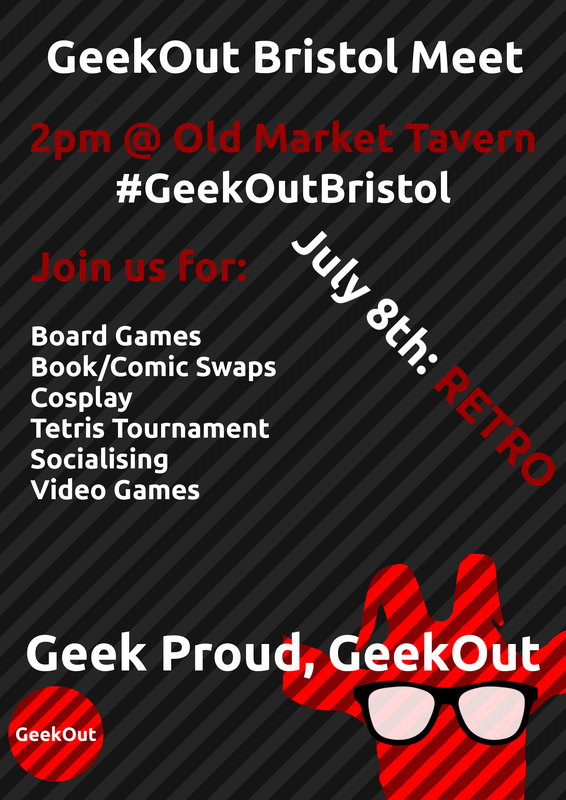 It was filed under Events, GeekOut Meetups and was tagged with Board game, Bristol, Bristol July, Cosplay, Geek meets in Bristol, Geek Stuff in the UK, Geek Things To Do, GeekOut Bristol Meetup, Geeks Bristol, Literature, Meetup, Retro, Retro Gaming, Things to do in Bristol, video game.